At Yoga Pod Boulder, we are proud to feature different yoga classes for the unique practitioners who call our studio home. There’s no one-size-fits-all approach to yoga that works, and the last thing you want in a yoga studio is to feel boxed-in or stagnant. Our yoga studio offers classes ranging from traditional vinyasa flow to hot classes to restorative and everything in between. 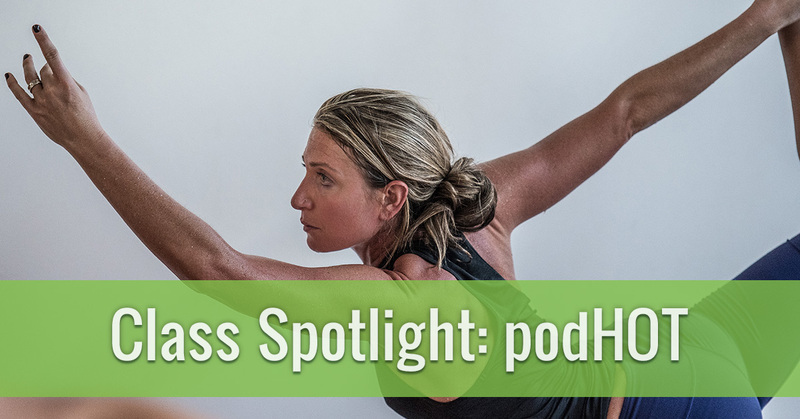 Today, we want to shine a spotlight on podHOT yoga classes so you can learn more about this incredibly beneficial type of yoga. podHOT is our spin on a traditional Bikram-style hot yoga class. Invented by Bikram Choudhury as a sequence for beginner yoga students, hot yoga has evolved into an incredibly popular yoga class type for students of all levels. Traditional hot yoga classes move through a sequence of 26 standard postures, organized by breathing (pranayama) work, a standing series, a balancing series, spine strengthening, and a cool down. Think of hot yoga as a series of postures hand-picked because they are the best and most well-rounded for your body. As a result, you leave feeling incredible. When you take a podHOT class, you can expect to move through this sequence of postures in an inspiring, supportive, and, of course, hot room. During a podHOT class, we set our thermostat to 105 degrees and crank the humidity up to 60 percent. Heated rooms come with distinct benefits, which we have outlined below. Detoxification: when you practice yoga in such a hot room, your body eliminates toxins more efficiently. Especially when you add in twisting postures, which the podHOT series does, you will feel rejuvenated and purified. Relaxation: podHOT classes focus on breathing which helps to relax your nervous system (responsible for the “fight or flight” response we feel on a daily basis). Muscle tone: this sequence requires you to hold postures for anywhere from 30 seconds to 1 minute, usually on one leg. The result is toned muscles. When you browse our yoga studio schedule, catch yourself if you skip over podHOT yoga classes and mistakenly assume they aren’t the classes for you. Designed originally as a well-rounded series for yoga students, the sequence has withstood the test of time and is so popular for a reason. Give podHOT a try the next time you visit Yoga Pod Boulder. Stop by our studio today and chat with anyone at the front desk about podHOT regarding any questions or concerns you might have. Give this class type a try, and remember that we also have five other yoga classes available if it’s just not your thing. Sign up for $30 For 30 Days to experience podHOT and more at Yoga Pod Boulder! We can’t wait for you to give this experience at try!